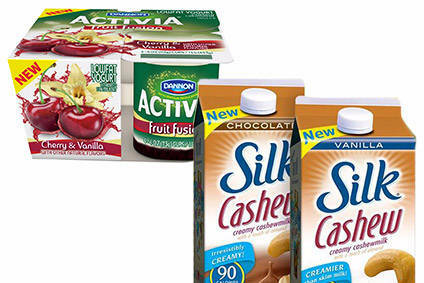 Danone is set to double its presence in North America through the acquisition of WhiteWave Foods and plans to let the US group's dairy alternative brands loose on the international stage. Danone announced a deal to acquire WhiteWave Foods this morning (7 July) in a move that values the Alpro maker at around US$12.5bn. The large-scale acquisition ramps up Danone's presence in the US and enhances its exposure to on-trend categories. For its part, WhiteWave expects the deal will move it to "the next phase of growth". just-food looks at how each group stands to benefit from the business combination. Danone must offload "a large part" of its toddler milk business in Belgium in order to address competition concerns raised by the European Commission over the French group's proposed acquisition of US-based Alpro maker WhiteWave Foods. WhiteWave Foods has booked increases in sales and operating income for the third quarter of 2016 – ahead of the expected completion of the US company's acquisition by Danone, which was announced earlier this year. Announced last month, it is one of the more notable M&A deals in the international food sector of 2016. But an organic advocacy group in the US has taken aim at Danone's planned US$12.5bn takeover of WhiteWave Foods. WhiteWave Foods, the US group set to be taken over by Danone, revealed a recent acquisition in Mexico as it published its half-year results yesterday (9 August). Danone's takeover offer for WhiteWave Foods – which received the unanimous backing of the WhiteWave board – is to be probed by lawyers representing WhiteWave investors. French dairy giant Danone has entered into an agreement to acquire WhiteWave Foods in a deal that values the Alpro maker at US$12.5bn and doubles Danone's size in the US market. For French dairy group Danone, improving the performance of its global dairy business and transforming it to a growth platform is a priority. As part of this drive, the company has launched an international marketing campaign for its Danonino yoghurt brand. Patricia Oliva, the global marketing director for Danonino, spoke to just-food about how the brand hopes to strike a unique chord with consumers. Danone's US arm has announced plans to simplify its ingredients list and follow sustainable agriculture practices. Danone insisted this morning (19 April) it is winning "key battles" in its bid to raise its sales and earnings trajectories by 2020. The French food maker flagged higher sales from its US dairy business in the first quarter of this year and predicted ongoing improvements from its European dairy operations. Danone also insisted the fundamentals of its Chinese infant nutrition business are solid despite recent challenges. Katy Askew reports.